This bear is golden-brown in colour, almost exactly 30cm (1ft) high. There is a number which I think is a serial number hidden on the label, reading 101040302640. The bear's torso is slightly bloated and its limbs are set at somewhat angular joints. The joints turn with quite a lot of resistance. The soles of the feet are a darker felt, very rough in texture. The fur is, as stated by the label, 65% wool and 35% cotton. It is fairly soft to the touch. The feet have stitches of dark thread on them to look like claws. The stuffing is very firm and isn't easily compressible. The unshown part of the label reads "Made in Germany by" (then a Steiff logo) "KNOPF IM OHR"
Beyond that, I can't really think of anything else to add unprompted. Thanks in advance to anyone who takes the time to look at this post! 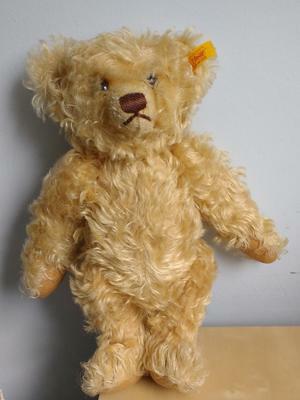 Just do a Google search on Steiff EAN 004353, the number on the yellow ear tag. The EAN (European Article Number) is a unique identifier for that style of bear. 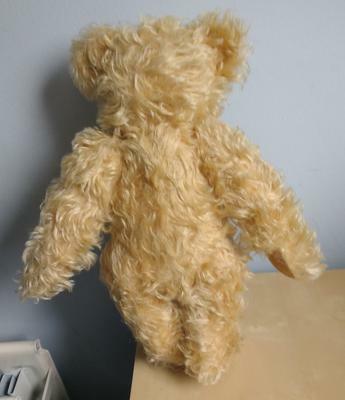 Also, I have a book, the Steiff Sortiment 1947-2003, and on page 37 it identifies this bear as "Classic Teddy Bear" period = 1999-2003, 35 cm, light blond, mohair woven fur, jointed, surface washable, growler, price category 3-4,which in 2003 (when the book was published) symbolized from 75 Euros up to 187.50 Euros. I do not have any more current information. This is a very beautiful bear, so take good care of him. Thanks. Steiff bears are well documented. Online search using number on ear tag should tell you when this bear was made.